Glitter Nail Sticker for kid - Fox #69836 Feature: 1. 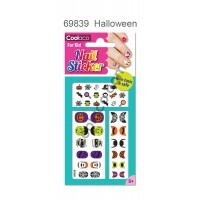 Non Toxic & saf..
Glitter Nail Sticker for kid - Halloween #69839 Feature: 1. Non Toxic & sa..
Glitter Nail Sticker for kid - Ladybug #69837 Feature: 1. Non Toxic &..
Glitter Nail Sticker for kid - Sweetie #69838 Feature: 1. Non Toxic &..
Glitter Nail Sticker for kid - X'mas #69840 Feature: 1. Non Toxic & safe (..